Vermont Restaurant Week kicks off today and runs until Sunday, May 4. Just in time, close to 400 attendees and a panel of expert judges selected the event's third annual Signature Sweet. The 10 contestants were handpicked by the Seven Days food team, but voting was up to the guests — each of whom was given three gold tokens with which to cast his or her votes — and the judges. 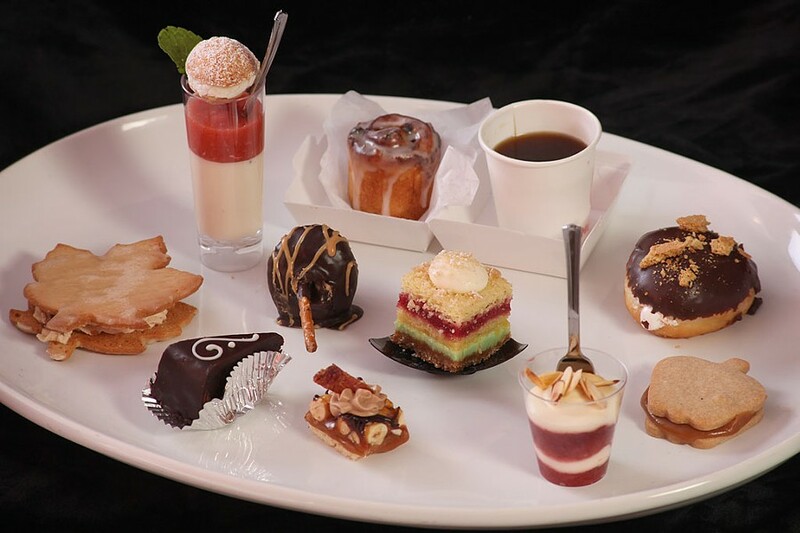 Audience votes counted for 50 percent of the final score for each pastry chef. With a $5 donation to Restaurant Week beneficiary Vermont Foodbank, guests could buy three more tokens to bolster votes for their favorites. The other half of the voting power belonged to the judges: New England Culinary Institute executive chef and COO Jean-Louis Gerin; Andrew Silva, one of the founding co-owners of Burlington's Mirabelles; and Lyric Theatre Company's executive director, Syndi Zook. After guests registered, they were met by two rows of five tables. For most, the first stop was Madeleine's Bakery of Milton, a favorite in the Seven Days office. 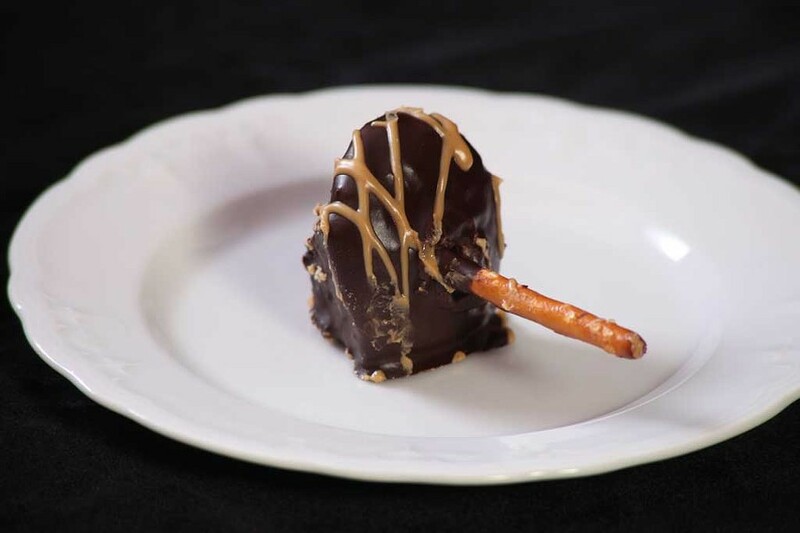 Owner Erika LeBlanc presented "Madeleine’s Magic Mushrooms," cake pops with a pretzel-stick handle. The mushroom-shaped body of each pop consisted of chocolate cake filled with peanut butter meringue, then enrobed in a chocolate shell and drizzled with peanut butter. Stefano Cicirello of Dolce VT was Sweet Start's first food truck representative. 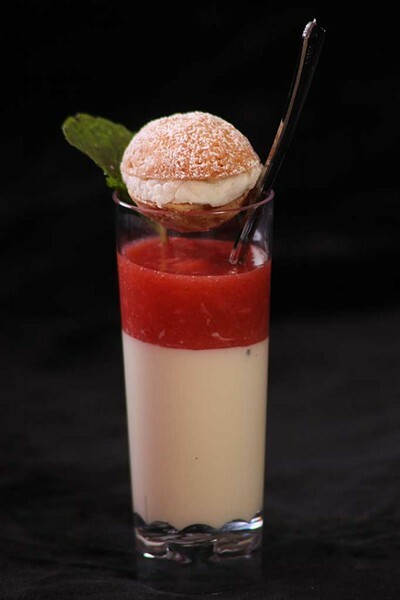 The highly concentrated almond cream in his strawberry-and-almond tiramisu packed one of the night's biggest flavor punches. The secret weapon of the smooth, creamy small bite was the crunch of a shower of perfectly toasted almonds. Shaftsbury-based Vermont Moonlight Cookies traveled the farthest to provide sweet treats. 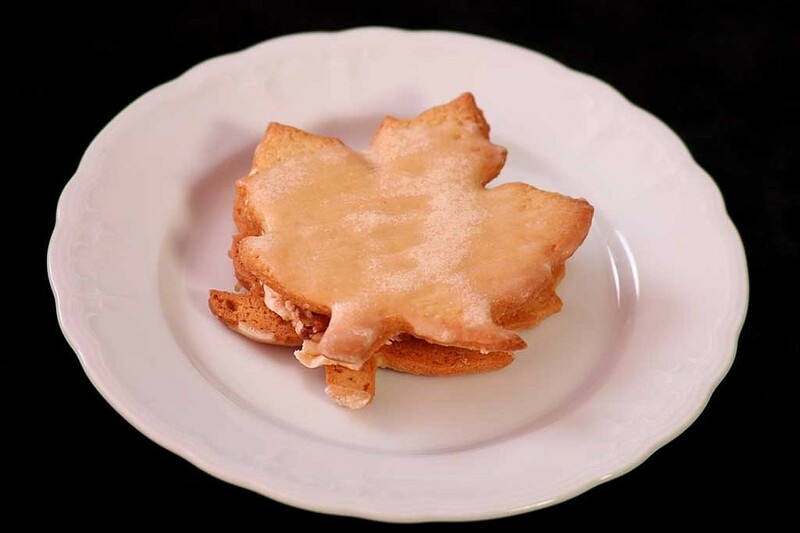 Owner Barbara Bacchi displayed the local products she used in her cookies alongside the apple-shaped desserts themselves. Cabot butter flavored the shortbread cookies, which were filled with Red Kite Candy maple caramel and dried local apples. Sweet Crunch Bakeshop's maple cookies are deservedly well known outside the bakery's tiny Hyde Park community. 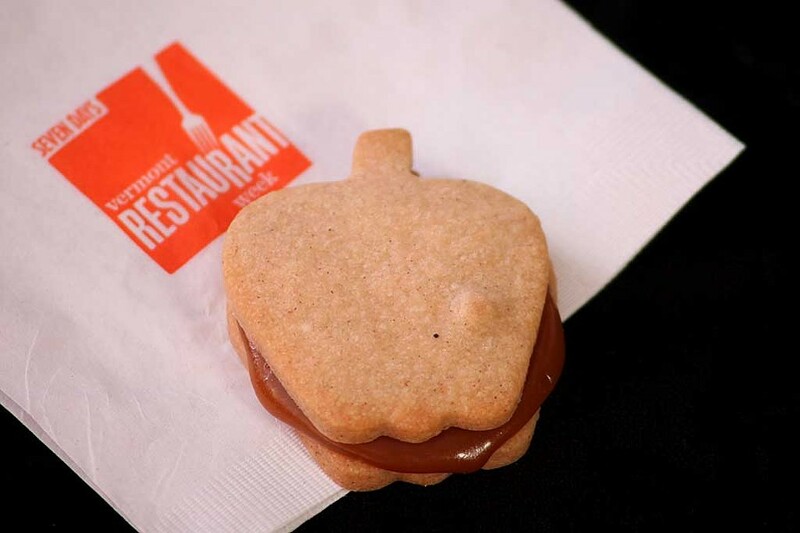 Chef Debbie Dolan Burritt served bite-sized versions of her signature cookie, amped up with caramel buttercream, sea salt and candied bacon. Their name, "Maple Umami Bites," proved wholly appropriate. Logan's of Vermont representative Chris Logan presented the night's most classic dessert. His deep, dark flourless chocolate cake was smooth inside with a crisp exterior. Fortunately, it was small enough that its richness didn't overwhelm. "Sweet Simone's OMG" elicited exactly that response from tasters. Though just a tiny bite, the dessert had a complicated description. 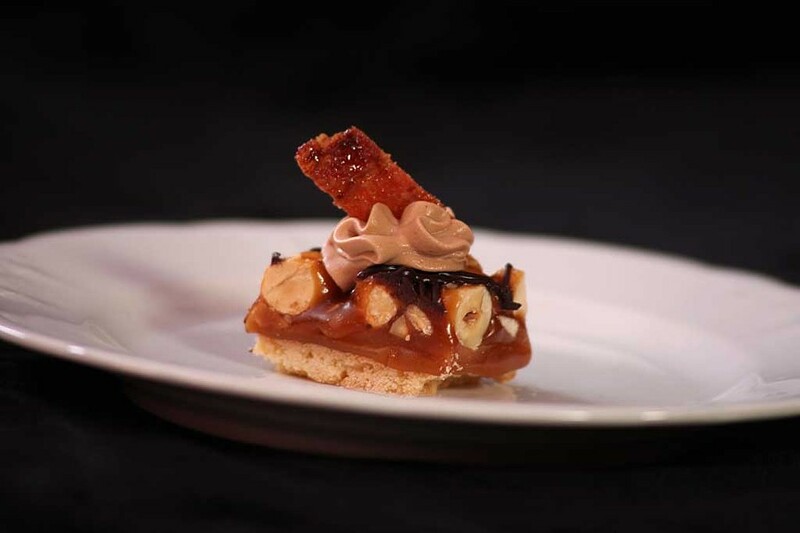 "A crunchy pastry base layered with salted caramel and hazelnuts, then coated in a bourbon caramel. 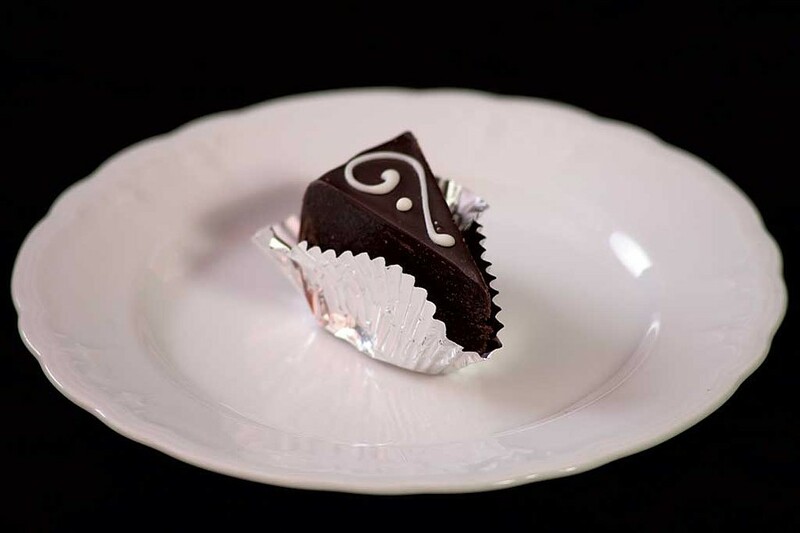 A crosshatch of chocolate ganache and a rosette of espresso-flavored mousse is finished with a piece of maple-sugar-glazed bacon," Waitsfield baker Lisa Curtis told us. In the end, what mattered was a combination of buttery caramel, crunchy nuts and salty bacon. OMG, indeed. Right next door, Chef's Corner created a table-sized tiki lounge with a Hawaiian-style wood carving and an array of tropical flowers. Even chef Alyssa Tourville had a bloom tucked in her hair. Her team's dessert was a similarly colorful take on a refined classic. 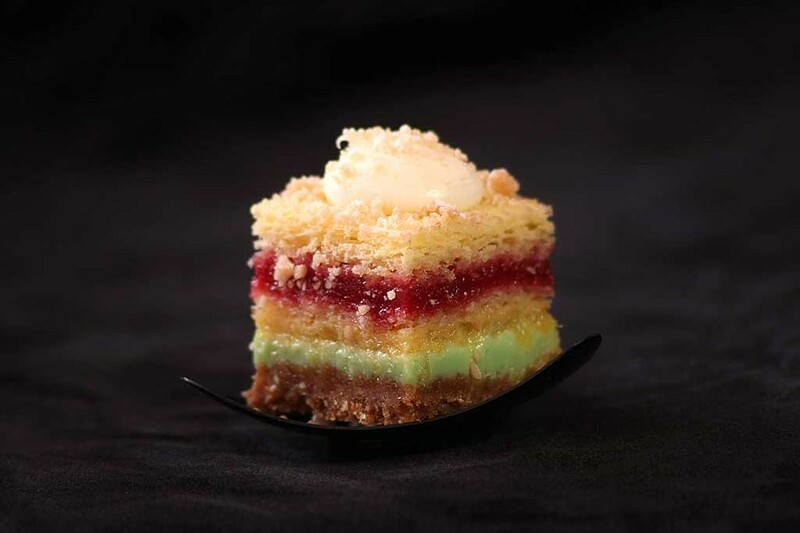 The Tropical Napoleon was made of vanilla cake layered with key lime, pineapple, coconut and strawberry, then topped with Vermont mascarpone and salted toffee crunch. A microwave was hidden beneath Little Sweets at Hen of the Wood's table. 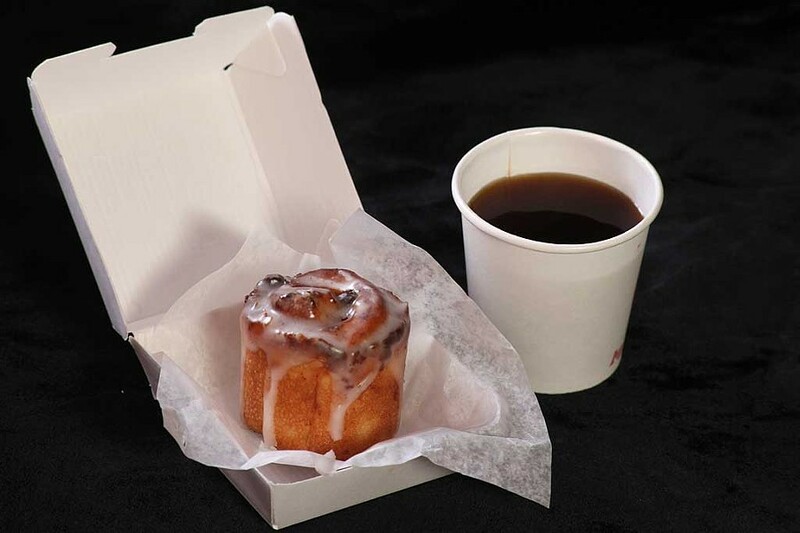 Pastry chef Andrew LeStourgeon used it to warm his tiny version of a classic cinnamon bun. He used top-flight ingredients to create a high-end version of the center cinnamon bun that he and his sister prized whenever their mother made a batch. He paired it with coffee from Maglianero, the Burlington café that sells his pastries and assists in Hen of the Wood's coffee service. Michelle Cunningham and Lauren Deitsch of South Burlington's Doughnut Dilemma told tasters that they're inspired by transforming everyday foods into doughnuts. 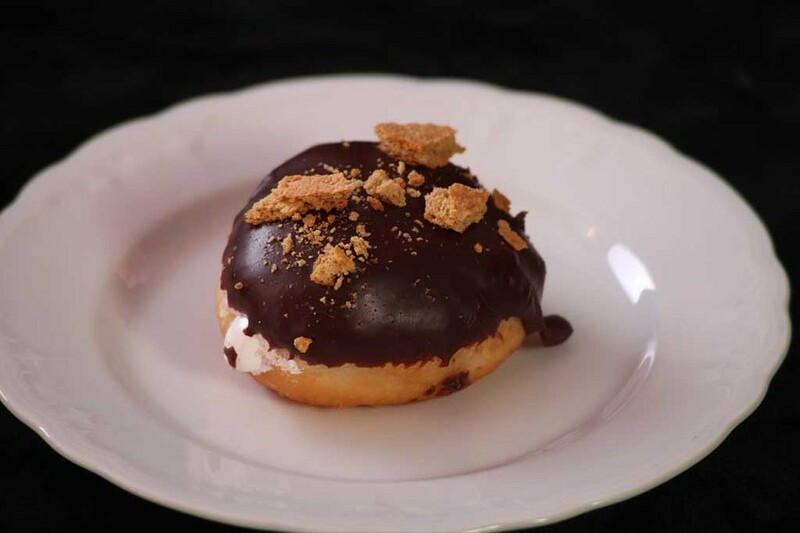 Their s'mores doughnut was conceived during an old-school camp-fire marshmallow-roasting session. But the ladies took their treat several steps further with a filling of homemade marshmallow fluff inside their yeasted doughnut. Dark chocolate icing and graham crackers ensured that the dessert really did taste like the s'mores the women envisioned. The final dessert was perhaps the most refined. 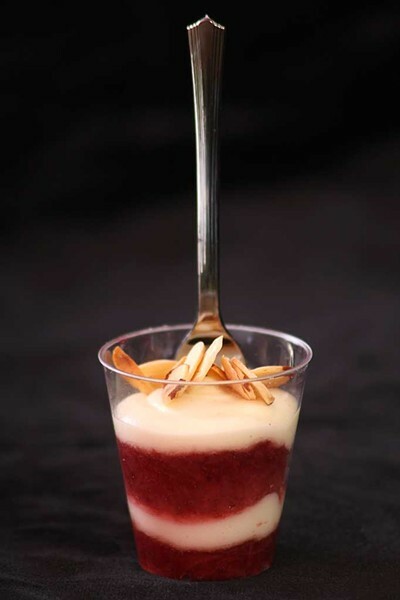 Emily Conn, best known for the delectable almond cakes from Burlington's Bakery at the Farmhouse Kitchen, served a vanilla panna cotta capped with a layer of strawberry-rhubarb compôte, then topped off with a tiny lemon-cream sandwich cookie. The judges agreed that Conn's dish was their favorite, but they were outvoted by the public. Little Sweets at Hen of the Wood, Sweet Simone's and Chef's Corner were called up to the stage as the top three finalists. 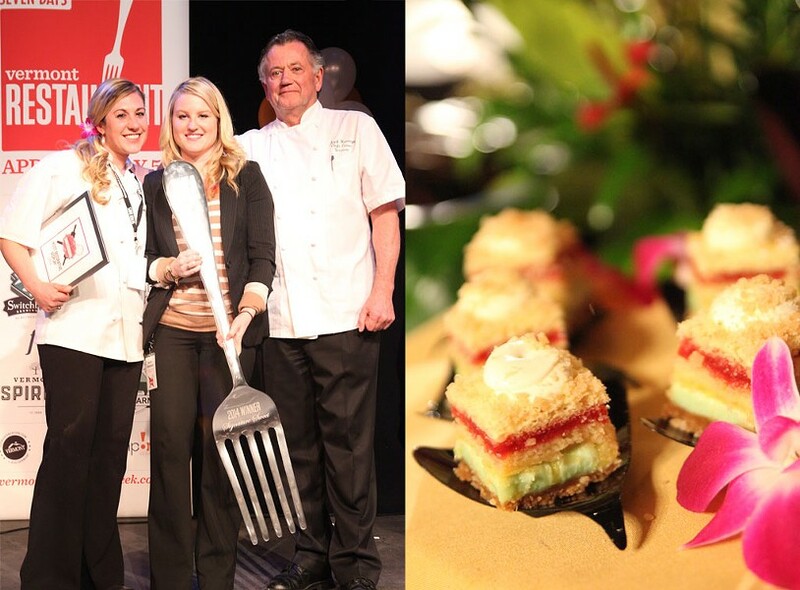 After some deliberation, the judges agreed with the cheering hordes: Chef's Corner's Tropical Napoleon was named the Signature Sweet of Restaurant Week 2014. Left: Smackdown winners Alyssa Tourville and Jozef Harrewyn of Chef's Corner with Kylie Webster (center) of Vermont Federal Credit Union. Right: Tourville's winning creation "Tropical Napoleon." Kylie Webster, a representative from presenting sponsor Vermont Federal Credit Union, presented Tourville and Chef's Corner founder Jozef Harrewyn with their trophy: a giant fork emblazoned with the title. Thanks to the sponsors, Higher Ground and the chefs, last night left us in a sugary haze, hopefully with room left for a week of serious eating.